Depositing Materials on Crown Land Proves Costly. A Hearst man has been fined for illegally depositing material on Crown land and ordered to pay the Ministry of Natural Resources for the cost of the clean-up. Robert Duguay was fined $200 for leaving camping materials on Crown land, and levied $4,294 in clean-up costs. 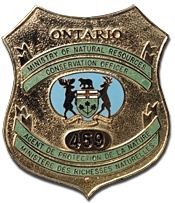 Court heard that on October 31, 2011, a conservation officer received public complaints that camping materials had been deposited on public lands on the shores of Pivabiska Lake, Hanlan Township. An investigation revealed that Duguay had camped in the area, leaving numerous items behind. The officer asked Duguay to retrieve the items. When he failed to do so, the Ministry of Natural Resources removed them for safety reasons. Justice of the Peace Jean Marie Blier rendered his decision in the Ontario Court of Justice, Hearst, July 9, 2013, after hearing the matter on February 12, 2013. ← $1,000 Fine for Shooting Moose From Roadway.